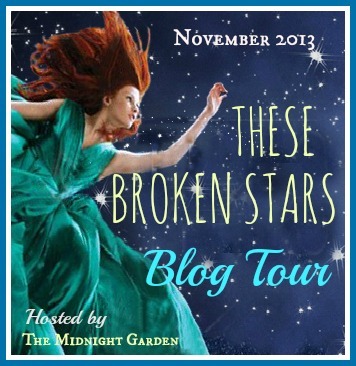 We’re pleased to announce we’re going to be hosting the official blog tour for These Broken Stars by Amie Kaufman and Meagan Spooner! It’s one of the most hotly anticipated titles of the year, and should definitely be on your radar if you’re a fan of scifi thrillers. This title has already gotten a lot of great reviews, which is hardly surprising considering the exciting massive space crash and the swoonworthy romance. I read the book a few months ago and absolutely loved it, so I’m very excited we’re helping to spread the word about it. The tour is slated to begin November 11 with at least 10 stops. Participants will receive a NetGalley widget invite, the opportunity for your readers to win cool giveaways, and exclusive content through guest posts, interviews, etc. This tour is currently open to US/Canadian bloggers, but there is also an Aussie leg in the works, so please stay tuned for more details if you’re interested. Sign up for the tour! The other tours we’ve hosted filled very quickly, so submit your information for These Broken Stars asap. (Please your NetGalley account email to sign up.) Remember, we have separate sign ups for each tour even if you’re already in our database. For our general reference, however, feel free to add yourself to our blogger database as well. We keep an eye out for blogs we think are a good fit for certain books, and do personally invite from time to time. Questions? Comments? Excited for this book? We’d love to hear from you. Incidentally, we’re late in posting this, but since Google Reader has been discontinued, don’t forget to add us to your Bloglovin List, too! Good luck to all of those who signed up! I got approved for this title on Netgalley and I’m soo looking forward to read it! I hope the tour goes wonderfully! I picked this up at BEA and look forward to devouring it!! All of this advice is priceless to me. I’ve been writing books and attempting publishing for years now, and I’ve set a lot of goals for the future. It’s always terrific to hear what authors have to say:) I read WLOM and I absolutely loved it, and I fell in love with how original the story is. I can’t wait to read book 2!! Ohh, I think you meant to leave this on the Once We Were post with Kat Zhang, Ashley! You may want to fix that, since I double-check winner’s entries and won’t see it there. Eeek! I already read it – sorry Wendy! I hope you get a new sigh up soon! I’ve got an e-copy of this one that I still need to read so I’d love to participate, Wendy! I was actually planning on getting started on my ARC within the next week or so. Oh good, I’m glad you have a galley! Tour spots are filling up quickly, but let me see what I can do. The sign ups for this one have been eating away at me for a full day now. I have to say that there is a huge part of me that wants on this BAD but with this contemporary funk I am in I just don’t think it’s a good time. Wishing great success for all participants on this tour! Aw, I know fall is a busy time. (I went through a big contemporary phase this summer, too–what is in the water?!) Let me know if you change your mind over the next day or so. I’m excited for this book. It sounds so amazing (and has such a beautiful cover!). I’ve always found Amie Kaufman’s posts over at Publishing Crawl really interesting too. Amie’s just a cool cat in general, you know? She and Meg are a terrific team, I’m sure you’re going to enjoy TBS! I loved this one–can’t wait to compare notes with you, Heather! I wish I could join, but I don’t live in the US. Ah, I’m sorry, Adelle! Hopefully the book will be sold for your territory soon and maybe they’ll be a tour then, too. Oh my gosh, this is awesome. Thanks for posting about this — I really I hope I make it into the tour. I am basically in love with this book! Thanks for signing up, Kelley. We always have way more people signing up then we have space for, but we try to do what we can. Thanks for the opportunity to sign up!! I have an ARC of this book and it was next on my reading list!! It sounds awesome!!! Aw, I know–sometimes we’re able to international tours, but other times the rights restrictions don’t always allow us to. I’m sure you’ll like the book, though! TARVER IS SO DREAMY. Thanks for the opportunity ;) This tour looks awesome! Hey Becca–you can look on any tour we host as a seal of approval of that book. ;) Incidentally, I read ADDICTED TO YOU recently and thought it was excellent! Didn’t realize that was you guys until after I finished. Oh, you’d like this one, Savy! I’m glad you signed up. I wish that I could join, but I don’t live in US or Canada. :( But maybe next time, someday, for another book I’m interested in. Aw, I’m sorry, Shannelle. It’s always possible that overseas publishers will put together blog tours, too–you should check with whoever handles this title when it’s released in your country.